When building your custom home, there are some important things to keep in mind that are often over-looked. The little details that truly separate a house from a home, and make any space both functional and beautiful. Here at Wood Haven Construction, we like to make sure that our attention to detail pays off, and that no item – no matter how small – is over-looked. Here are a few of the least-commonly thought-of tweaks and considerations that can contribute to the fuller enjoyment of your new home, and if you think of them ahead of time, you can save yourself a lot of money by addressing them up-front. Are you always too hot, or too cold? The problem might not be with you, but with your insulation! Retrofitting your home with a higher R-value insulation can cost easily five to six times as much as it would have to do it “right” the first time. Don’t skimp on your insulation just to save a few dollars. More and more, people are mounting flatscreen televisions on their walls, and looking for ways to hide the “spaghetti” of cables and cords that comes along with such a project. The solution, of course, is to run cable conduit where you need it. But that requires you to think about where your television (and other components) are going to go, and to plan accordingly. Running conduit before the drywall goes up can cost a few hundred dollars, but retrofitting it in after the fact can easily go up over a thousand dollars. Everyone agrees that laundry is a chore. But why make it any more work than it needs to be? When planning your custom home, why not take advantage of the ability to locate the laundry room near the bedrooms, instead of in a far off corner of the house? Keep the laundry convenient, and you’ll save time as well as energy when it’s time to tackle this chore. Doors are often taken for granted, but how often have you found yourself thinking, “If only this door opened the other way?” Probably more times than you care to admit. Poorly-planned doors can block access, block other doors, and just create traffic jams in unlikely places. Think about them ahead of time, visualize your traffic patterns, and eliminate these headaches before you have them. It’s easy to look at a floorplan and think, “Oh, we have enough closet space.” But in reality, that’s almost never the case. When you’re looking over your plans, try to keep an eye out for framing “pockets” and other wasted space. Those can easily be turned into storage, especially at the planning stage. But to convert that space under your stairs after the fact? There’s no reason that a custom home should ever lack in innovative storage locations, or the use of space (no matter how small). So many homes have only two water faucets: one out front, and one out back. While these are enough for many, sometimes a third or fourth faucet really makes sense – especially with the larger yards and one-storey homes that are popular today. Easy access to faucets, instead of dragging enormous lengths of hose across the lawn and flower beds, is something to really consider. Electrical outlets, as well, are often in short supply. Add an extra covered outlet or two during construction, and you may find that your yard is a lot more useable for you right away. A half-bathroom near the back (or side) door is often much more practical than people will admit. Imagine that you’re outside, working in the yard, and nature calls. Just how far through your house are you willing to track mud and dirt to get to the bathroom? Rest assured that when you build your custom home with Wood Haven Construction, we keep these points – and more – in mind while we work with you to build your home. 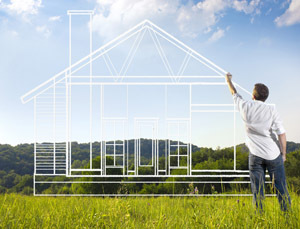 Give us a call today to find out how we can help build your dream home in Houston! Do you often feel you should have a wonderful place as your home, a place which exclusively belongs to you and reflects your style, preferences and persona? Do you think a home is not only an asset which you can buy and sell as necessary, but a personal space to which you are eager to return after a long, exhausting day at work? No matter how many restaurants, clubs and malls emerge in the city, the feeling of ‘being home’ can be achieved nowhere else but your house and designing it with your very own house floor plans can help you make it a true sanctuary. This is where Wood Haven Construction can help you. As custom home builders in the Houston area for over 25 years, our wealth of knowledge and experience can help you realize your dream home. The most obvious benefit of building a custom home is that you get EXACTLY what you want, and don’t have to compromise. And, with out innovative Custom Home Building Management Program, we keep costs low by putting you in charge of costs while allowing you to benefit from our wealth of expertise. Our Management Program allows the home buyer to be as involved in the process of building a home as they want, with total transparency and oversight. As the contractor who designs and builds the custom home, Wood Haven Construction assumes the full responsibility over the project, while working with the to-be-owner as a true partner. We focus on clear communication and constant updates in order to avoid potential problems. With this innovative approach to building a custom home in Houston, Wood Haven has a history of happy clients. Call us today to find out how we can help you build YOUR dream home.